In light of Axial capacitors being harder to find, not very good spec, or simply stupid prices, I came up with this little adapter board design. 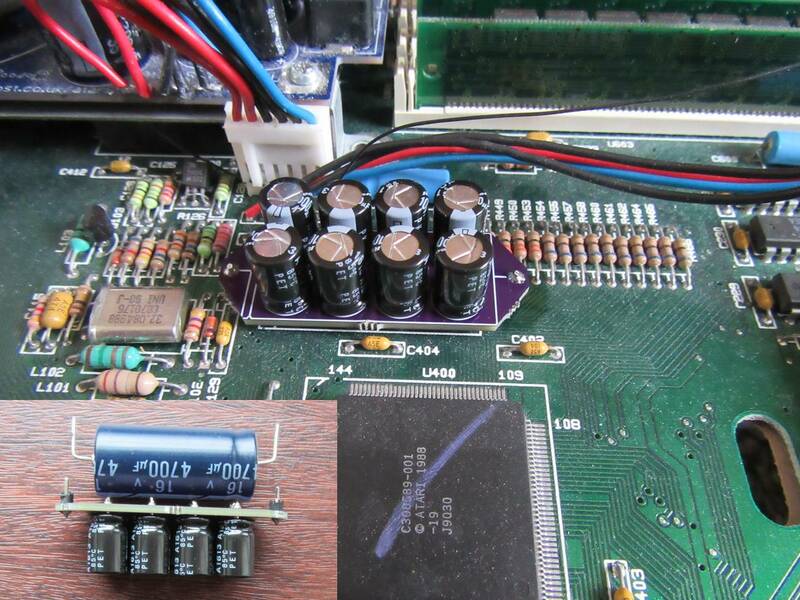 The main challenge was finding some small enough capacitors with a good ESR rating. The 4,700uF capacitors are used on my Atari's from the ST to STE, to Falcon so this design is a one size fits all type solution, at least for the 4,700uF value. The overall size of the board isn't any larger than the existing axial capacitor. While the 4,700uF original probably has a pretty bad ESR figure, my board has a bank of 8x 1,000uF low ESR capacitors which can push 660mA per capacitor (5,280mA total). This is likely a huge overkill, but less capacitors can be used. I am also aware of many other axial's from 2,200uF down to 100uF (and possibly lower on the Falcon). Smaller boards could be done to replace them all with basically ceramic based cap-boards. At least then they would never degrade over time like electrolytics do. The cost of this one off board was getting towards £10 in value, likely higher priced than a good quality Axial, so I am unsure if it will get produced as a kit unless there is enough demand to get the prices down.